To make mince Pies (78) Boil twelve eggs hard, leave out half the whites. 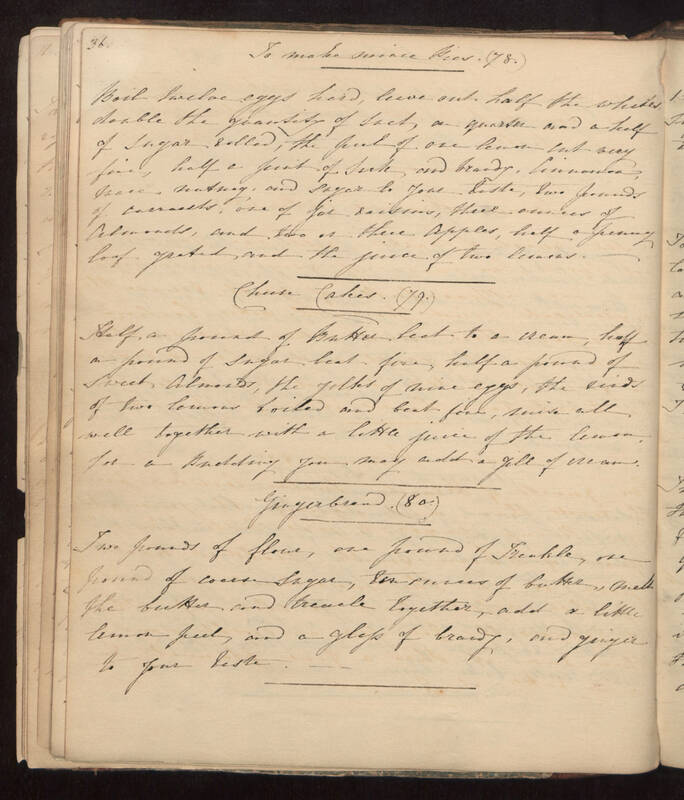 double the quantity of Sact, a quarter and a half of Sugar rolled, the peel of one lemon cut very fine, half a pint of Sact, and brandy, Cinnamon, Mace nutmeg, and sugar to your taste, two pounds of currants, one of jas raisins, three ounces of Almonds, and two or three apples, half a penny loaf grated, and the juice of two lemons. Cheese Cakes (79) Half a pound of Butter beat to a cream, half a pound of Sugar beat fine, half a pound of Sweet Almonds, the yolks of nine eggs, the rinds of two lemons boiled and beat fine, mix all well together with a little juice of the lemon For a pudding you may add a gill or cream. Gingerbread (80) Two pounds of flour, one pound of Treakle, one pound of coarse Sugar, ten ounces of butter, melt the butter and treacle together, add a little lemon peel, and a glass of brandy, and ginger to your taste.